Porcelain Manifesta: What's A Vegetarian/Vegan To Do? What's A Vegetarian/Vegan To Do? I've read enough to know that Monsanto ranks in the top five most evil companies in history. For those who may not know they are a biotech corporation that makes herbicides - like the Roundup people use to kill weeds. The super heinous part is how they also own the genetically engineered seeds that are the only thing that can survive their chemicals. So they basically have strong armed the American farmers into only using their seeds; poisoned all of our food with their chemicals and...well just watch Food, Inc. It does a great job at explaining it. So I was already really turned off GMOs (genetically modified organisms) when a friend of mine sent me this article from the Huffington Post about how Monsanto's GMO corn is damaging rat organs. Ugh. (double ugh for animal testing) I mean who ever thought that manipulating an organisms genes to gain fortune or fame would be a good idea? Hasn't anyone ever read a science fiction book? It never ends well. Because of this culmination of information I've been ingesting as of late, I've been taking a closer look at my vegetarianism. In the fifteen years I've been off meat a lot has changed. Vegetarian options abound. Not only in grocery stores, but in restaurants and I'm not talking about a grilled veggie plate or a Caesar salad, hold the dressing. I'm talking about "meat alternatives." There are so many faux meat options at Whole Foods these days it's hard for a girl to choose. Most of it is really good. But lately I've been wondering - what's it made of? The short answer is - soy. And that brings me to this article by Jennifer Grayson where she informs that 91% of soy is GMO. Yes, 91%! That means all the tofu, the veggie burgers, the Facon (fake bacon) I consume is most likely from Monsanto GMO seed. I don't want to support that! Nor do I want to ingest it. According to Grayson there isn't much we can do about supporting it. GMO cotton grown in the US is at 87%. And cotton is nearly everywhere. The answer is buy organic, of course. Buy organic cotton clothes where you can and buy food that is 100% organic. Morningstar Farms, a company owned by Kellogg - cereal giant, does have a line of organic soy products. They aren't vegan, however. I also found Soyboy - organic tofu and tempeh - that even sports a non-GMO logo. So that's good news. 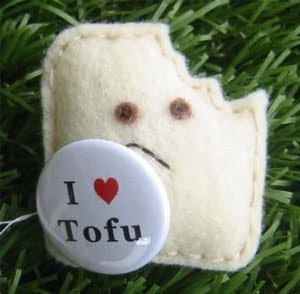 I can give up the fake meat, but tofu too? That would be unfair. Their website does not list a location for purchase, only a generic health food store near you, but I'll be keeping a lookout. I am a little depressed and also angry about all this. My goal in abstaining from eating meat was to make my little mark against the way this country produces and process its meat. And it's clear the way it produces its crops is no better. I try to remember though, that being a conscious consumer is the only way things will change. This reminds me of a recent conversation I had with a lovely woman who was proudly no longer the manager at the Chicago Diner. The reason she left is because they added a deep fryer and that was the last straw. She explained that their Vegetarian menu consists entirely of processed, nothing-organic GMO crap. Yes, it is Vegetarian but still terrible for you.